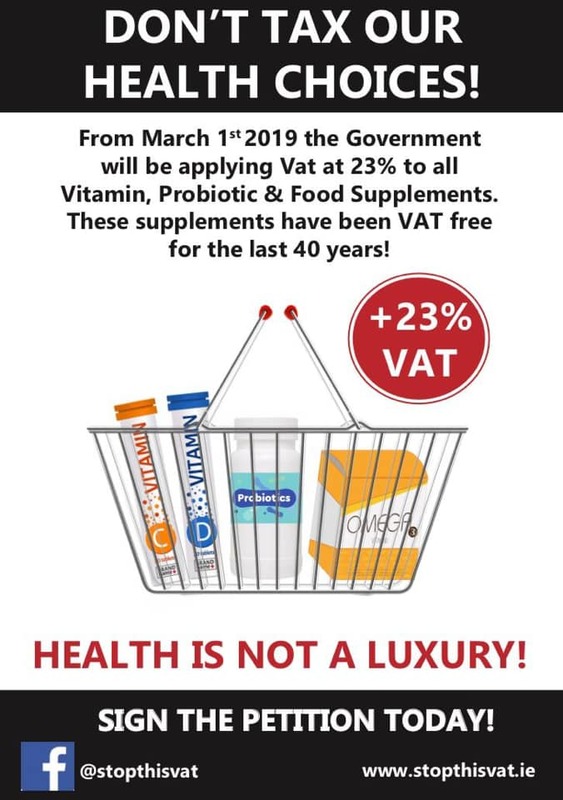 Independent health food stores are running a national day of action to highlight a planned 23% consumer tax hike on vitamins, minerals and food supplements. Health Stores Ireland shops from Bandon to Bundoran are using the theme of “Black Friday” to highlight the impact of the VAT increase on customers who purchase supportive nutritional products like fish oils, glucosamine, probiotics and vitamins like folic acid and vitamin D.
Health Stores Ireland spokesperson, Matt Ronan said “we are witnessing the outrage from consumers to the tax hike that we had predicted”. Customers, especially elderly and those with long term chronic conditions, are expressing frustration at a needless price hike on products that supports their attempts to take control of their health and wellbeing. These products are often recommended by GP’s and hard pressed consumers are finding the Revenue enforced escalating price as a misjudged barrier to health promotions and self care. Black Friday will see health food stores and pharmacies highlighting their instore petitions, blacking out their windows and supplement bays and circulating petition postcards on Friday, 8th Feb.
Over 35,000 people have already signed petitions calling for the Minster for Finance and the Minister for Health to revisit the planned VAT hike and to fulfil his promise to the Dail from last November that the matter would be examined by the Tax Strategy Group to access its social and economic impact before it’s considered.